It is 1933, the Year of the Scorpion. 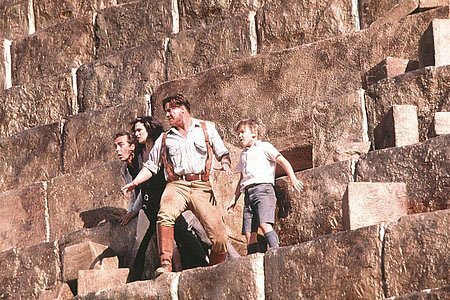 Eight years have passed since dashing legionnaire Rick O'Connell (Brendan Fraser) and fearless Egyptologist Evelyn (Rachel Weisz) fought for their lives against a 3000-year-old enemy named Imhotep (Arnold Vosloo). Rick and Evelyn are married now and have settled in London where they are raising their son Alex (Freddie Boath). When a chain of events finds the corpse of Imhotep resurrected in the British Museum, the mummy Imhotep walks the earth once more, determined to fulfill his quest for immortality. But another force has also been set loose in the world ... one born of the darkest rituals of ancient Egyptian mysticism, and even more powerful than Imhotep. When these two forces clash, the fate of the world will hang in the balance, sending the O'Connells on a desperate race to save the world from unspeakable evil and rescue their son before it is too late. Their quest will take them back to Egypt, into the realm of The Scorpion King (The Rock). This fierce warrior promised his soul to the god Anubis in exchange for military might long ago. He and his army have been frozen in time, suspended between life and death and ready to kill again, through five millenia. The Scorpion King possesses powers, secrets and strengths beyond even the dreaded Imhotep. 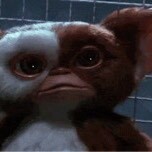 He is angry, deadly and should not be disturbed. 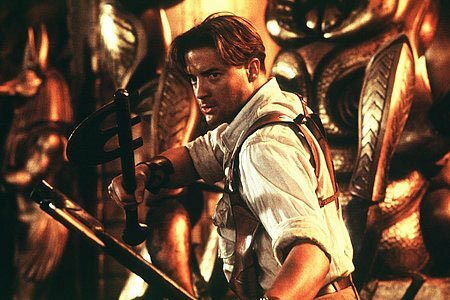 The Mummy Returns unfurls its spine-tingling adventures against breath-taking landscapes. Hordes of canine-bodied Anubis warriors - literally from hell - bound across the Sahara in attack formation while carnivorous pygmy mummies ambush their prey in the jungles of the Nile. At the fabled desert oasis of Ahm Shere, a mythical pyramid of gold mesmerizes all who behold it, but according to the shadowy desert sage Ardeth Bay (Oded Fehr), no one who has ever laid eyes upon it has returned to tell the tale. Unfortunately, reaching that pyramid is the only way Rick can save his family. But it's not as if London is any safer - the city's streets become a living nightmare when a squadron of skeletal attackers lays seige to a red double-decker bus -with Evelyn's brother Jonathan (John Hannah) behind the wheel. Universal Pictures and Alphaville Productions have reunited the entire starring cast and creative team of the 1999 blockbuster The Mummy to create the adrenaline-charged adventures of The Mummy Returns. The returning stars include Brendan Fraser, Rachel Weisz, John Hannah, Arnold Vosloo, Oded Fehr and Patricia Velasquez. 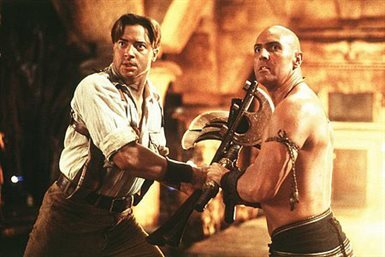 Joining The Mummy veterans are WWF superstar The Rock as The Scorpion King, screen newcomer Freddie Boath as the O'Connells' son Alex, Adewale as Lock- Nah, Alun Armstrong as the Curator and Shaun Parkes as Izzy, a pilot and former compatriot of Rick's who is reluctantly drawn into the action. Stephen Sommers is back as both writer and director, sweeping his vision across Egypt, England and several millennia with The Mummy Returns. Also returning are the first film's producers, James Jacks and Sean Daniel, as well as director of photography Adrian Biddle, production designer Allan Cameron, costume designer John Bloomfield, and editor and executive producer Bob Ducsay. The effects wizards at Industrial Light & Magic, once again led by Academy-Award winner John Berton, are also back in full force for The Mummy Returns. Download The Mummy Returns in Digital HD from the iTunes store. The Mummy Returns images are © Universal Pictures. All Rights Reserved. The Mummy Returns images © Universal Pictures. All Rights Reserved.